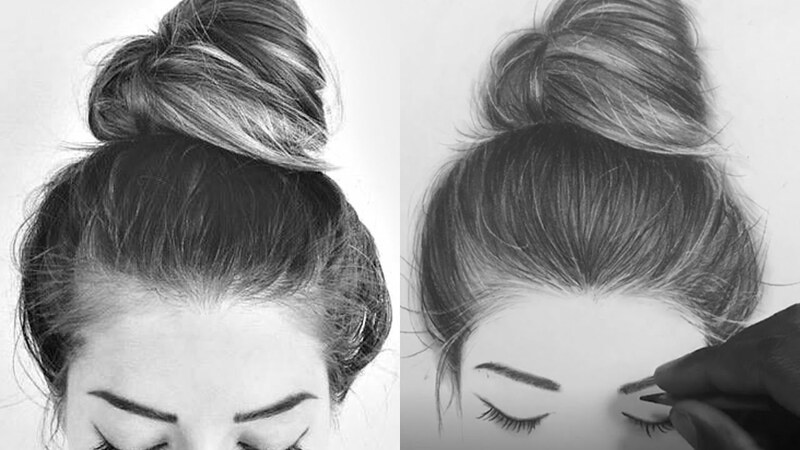 How to draw hair for beginners is just another technique that needs to be learned to capture the realistic features of the face. This is especially true for beginners looking to draw or paint portraits. No two strands of hair are the same and this makes it challenging for the untrained eye. Browsing the world wide web we have found a great video for an anime hair tutorial. The main reason anime is so popular is the creative storylines, characters and worlds tend to captivate the audience. It is ironic though how the characters when drawing them are quite simple and understated. How to draw realistic curly hair can be exactly like trying to tame real life curly hair after you have washed it. It tends to puff out, nothing sits where it should and it just looks like a mess. The same could be said with your drawing if you don’t stick by this one rule. That is follow the flow of the hair and this will make it easier to tame. When someone asks how to draw straight hair it is a great day. This one is super easy to recreate and all you need to focus on the dark and light shades as it flow from the scalp of the head and down to the tips. There isn’t much involved in drawing straight hair and is quite easy to make it look realistic. Learning to draw hair is a technique needed if you are interested in drawing portraits. It is what you add to the face as the last step in any drawing. Once you have the face features perfected you move onto the hair. Above is a hair drawing tutorial that has some great hints and tips that would be useful if you need some help with drawing hair. When learning how to draw hair step by step for beginners it is wise to find some suitable lessons for when you are just starting out. We always recommend comprehensive, easy to follow and information in a step by step format to alleviate any frustration. There will be times you might find yourself totally confused but go over the technique again and keep practicing. Anime hairstyles in real life are quite popular when people want to dress up as cosplay for conventions. Thousands flock to these conventions for the anime/manga art and to meet their icons from anime shows. The dedication these fans show to the art form is amazing and makes it clear it is becoming extremely mainstream. One of the difficult aspects of learning how to draw curly hair step by step is that all curls will be different. No two curls will be the same and the way they sit on the head can change from second to second. If your new to drawing portraits always practice with a reference photo before moving onto real life subjects. It will make it a lot easier for you. With a popular search topic of how to draw hair easy it is important to note that easy doesn’t always mean correct. You can jump online and find hair drawing tutorials that make the task seem easier but it can actually hinder your progress. Taking a short cut is not always the best way to go with drawing as it will catch up with you later down the track. How to draw cartoon hair for guys is so much easier than attempting to draw female hair. Guys hair is always less complex when drawing portraits. There is so much attention to detail in the female hair line and so much more of it. Male hair on cartoons is usually a lot less and tends to be short and spikey. If you are looking to draw ballerina’s you might want to learn how to draw hair in a bun. All ballerina’s wear ballet buns and the intricate details drawing it makes it just as hard as if you were making the hairstyle in real life. If you’re a male best to avoid this topic unless you are well versed in ballet hairstyles. Usually boys hair tends to be short and making it easier to get it looking lifelike in your portraits. For the most part you will simply be learning how to draw straight hair. Although it is straight you still need to pay attention to the lines and flow otherwise it can look like lifeless and more like a cartoon image. If you have thick, black hair it can be challenging in real life to tame it. It might get you thinking about how you would draw your hair. If you are looking to do a self-portrait and hair isn’t your strong suite then try drawing the hair in an up style. Learning how to draw a messy braid is ideal for those thick locks. Learning how to draw cute hairstyles is a great topic for teenagers learning to draw. It something they can find relatable and gives the freedom to express in their drawings instead of real life. This is especially true if they like crazy hairstyles. They can copy from images of their favourite singer or actress or create something from their imagination. If you are a keen drawing enthusiast and looking to improve your current skills there is a great hair drawing tutorial video above. It is based on drawing male hair and is a short video with heaps of great techniques. Worth a look if this is a topic you are struggling with or just looking to brush up your skills. It can be difficult when drawing wavy hair to keep it consistent and realistic. Learning how to draw soft wavy hair is for intermediate to advanced drawers due to the elements being different strand by strand. The last thing you want is it to look like a mop on top of the head rather than lifelike. Start off in small strands to get the right balance. Learning how to draw short curly hair can be difficult. My advice for anyone having trouble with drawing hair is to concentrate on the light and dark areas. Teach yourself to spot the difference and work on creating a more balanced drawing rather than all the same shade. It will make it look more realistic and lifelike. Are you looking for something different to do on your drawings? Why don’t you try different hairstyles when drawing the female form. How to draw a messy braid is quite popular among female artists so next time you want to give your drawing a bit of a difference work to incorporate different types of hairstyles. Girls love learning how to draw cute hairstyles. It makes it a fun environment for them to test out different hairstyles in their drawings instead of in real life. Let them explore crazy coloured hair or even short and spikey. There is no end to the different hairstyles they can experiment with. The crazier the better. Here is the number 1 tip when learning how to draw hairstyles from the back. Can you guess what it might be? We recommend taking a photo of your own hair from the back so you can see how it sits and flows. If you have family or friends with different hair styles than take a photo of those as reference points if you get stuck. It is handy to have and gives you a feel for the hair for realistic drawings. How to draw hairstyles step by step is like creating a hairstyle in real life. You take small bits at a time and piece them together. Follow along with some helpful lessons that give you the necessary information without confusing you. If you start to get a bit overwhelmed, then take a break and come back to it when you have cleared your mind. Would you believe people have anime hairstyles in real life? Imagine drawing a portrait of someone with anime hair. It is such a distinctive style that can be super long, or it can be short and wispy. You should start practicing the cartoon versions just in case you come across someone wanting a portrait done so you are well versed in the art of drawing anime. With most things in anime drawings they tend to be simpler than the normal human form. This is not the case for the anime hair. It is a bit more difficult than normal hair due to its length and the style. Learning how to draw anime hair for beginners can be tricky so best to follow along with step by step lessons to give you a good understanding of the technique. Learning how to draw a messy braid is always a good way to start your drawings before you attempt a neat and proper braid. This allows you room for trial and error and doesn’t focus on it being too perfect. The long you want is messy which is great for beginners.